Jason Mandryk, author of the 2010 edition of Operation World which features the prayer needs of 229 countries in the world. All photos courtesy of Operation World. Greenland. Chad. Thailand. Seychelles. Venezuela. Japan. Singapore. Seemingly disparate countries with little in common. But what is one thing that is true of every country in the world – all 229 of them ­– today? The answer might surprise you: There are functional churches – groups of believers meeting together to worship Jesus Christ – in every single country in the world, according to Jason Mandryk, author of Operation World: The Definitive Prayer Guide to Every Nation. Operation World contains country information and the spiritual needs of 229 countries with the purpose of mobilising prayer for the nations. Mandryk said: “In the 1960s, places like Mongolia and Nepal only had a handful of believers. Now, there are thousands and tens of thousands. Salt&Light had the privilege to speak to the man responsible for publishing the latest edition of Operation World, Jason Mandryk. 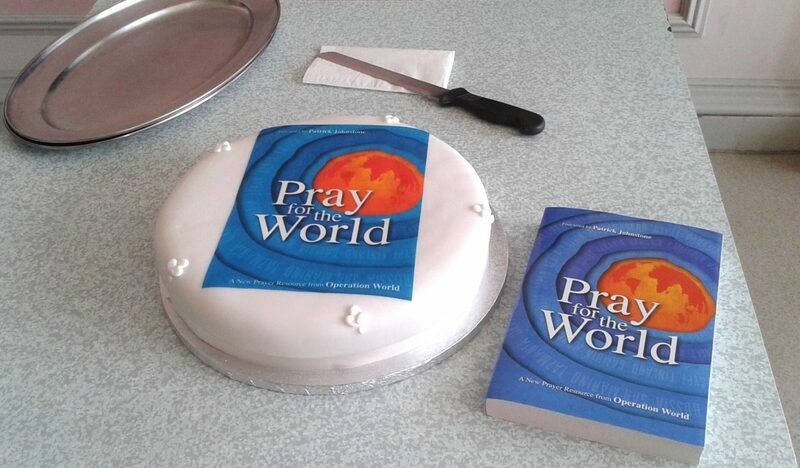 First published by Patrick Johnstone 55 years ago, Operation World is a thick reference book that contains country information and the spiritual needs of 229 countries with the purpose of mobilising prayer for the nations. Mandryk has served in Operation World for almost 20 years; he was mentored by Patrick Johnstone for seven years before being handed the reins. Can you introduce Operation World and the work it does? Mandryk: Operation World began in Africa, in a context and time where it was very, very difficult for African believers to get information about the outside world. We relied on a network of contacts to serve the larger Church by informing them of the prayer needs of the different nations. 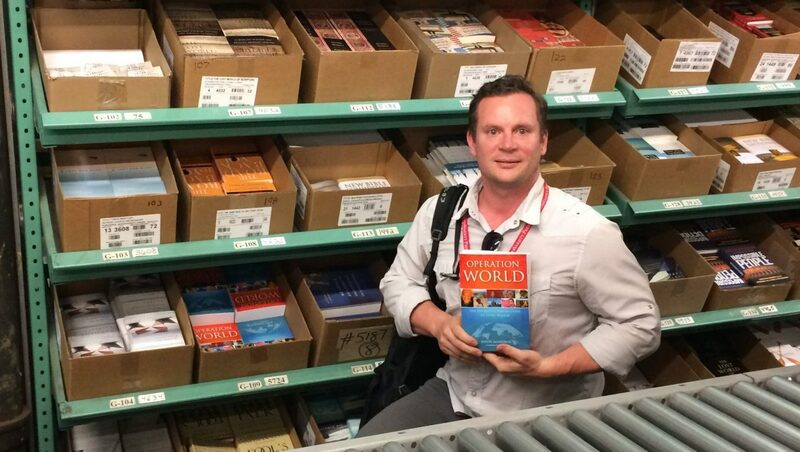 Exactly 978 pages of prayer needs from 229 countries in the world. The original edition was produced in 1964, from South Africa, and was only 32 pages of basic information about 30 countries. That’s what we still focus on today. The world is just too big and we are, as a ministry, too small to be able to literally go to every country. The team right now has just five people – of whom two are full-time. So, rather than depending on just our own capacity as researchers, we depend on the relational networks of over 2,000 church and ministry leaders around the world to find out how God is at work, country by country and issue by issue. We tap into their expertise, experience and perspective to help the global church be aware of the current situation and the most significant ministry needs of each country and how Christians can pray and act accordingly. 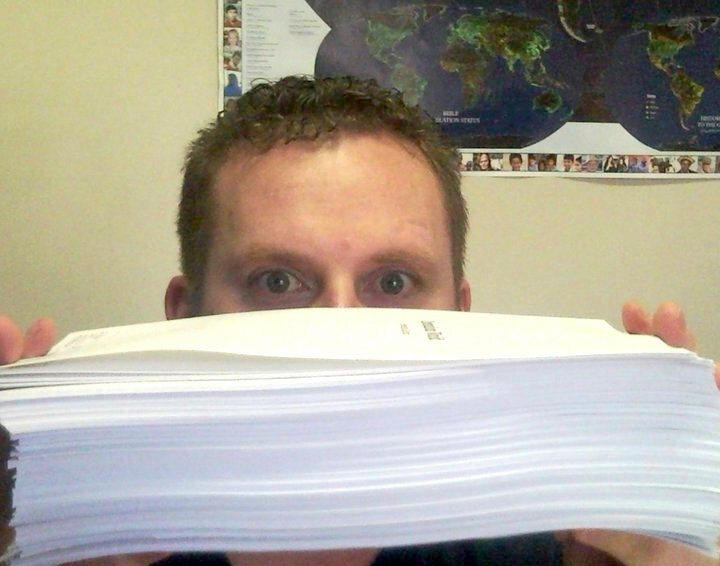 Mandryk, holding up the hard-copy proof of the 2010 edition. There are multiple runs of editorial processes including a feedback loop where contributors and contacts can critique and give input that shapes the material before it is published. That’s a heavy responsibility. What are the joys of this ministry? Mandryk: Meeting people who are serving God as missionaries because of Operation World. It’s so encouraging that we’re having that impact on mission mobilisation in that indirect way, and that God is answering prayers through the very people who are praying for them! People often say: When I was praying through Operation World and I was reading the section on Turkey or some section, God called me to be a missionary to that place. And at times, it has been the thing that has kept us going amidst so many challenges, sometimes, discouragement. Pray for the World (2015) is an updated, abridged prayer handbook available in seven languages including: Russian, Korean, Chinese and Portuguese. 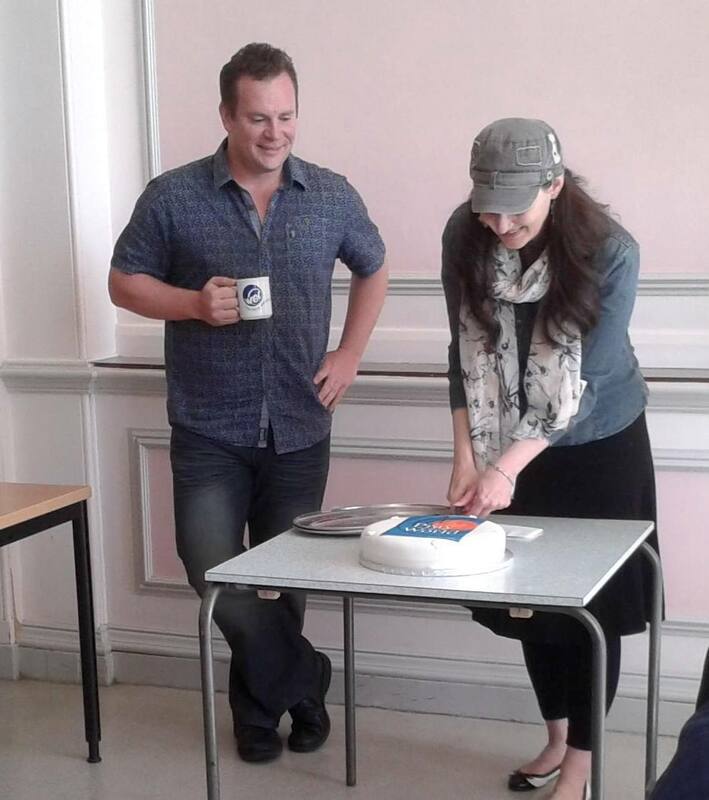 This cake (left) was made in celebration of the publication of the book in 2015. For those from countries where the church is small, poor, under pressure and enduring suffering, it is encouraging for them to know that the global church is aware of their needs and praying for them. That compels us to continue our work so that those brothers and sisters of ours who are suffering can be advocated for so that prayer and ministry can be raised up on their behalf before their fields of need. With so much information on hand, can you comment on the unique challenges Christians face today? Mandryk: The effect of globalisation is very keenly felt in the Church. For example, even though Christians speak thousands of languages and come from thousands of different cultures, increasingly, we’re singing all the same songs and listening to the same thought leaders or celebrity pastors … for better or for worse. Sometimes biblical truth is truth no matter what your context is. But good teaching for a Nigerian may or may not be good teaching for an Australian, or possibly, a Pakistani. And so we have to recognise that we must equip the Church to be effective in its local context. Jason Mandryk (left) and Molly Wall (right) are the two full-time workers at the helm of Operation World. Another challenge that is taking a new shape is the challenge of tolerance, freedom and persecution. Some places have been dealing with that for centuries. But in other places, the acceptability and respectability of the Christian message and the Church as an institution is eroding very quickly – we’re seeing it happen before our eyes. One of the many implications is that the Global North church is going to have to learn from the Global South church how to handle persecution and being on the outside of the corridors of power rather than in the midst of them. Places where the Church suffers for Jesus, we also see the work of the Holy Spirit. There seems to be a relationship between persecution, pressure and church growth in contrast to complete religious freedom and church stagnation. It’s a fascinating dynamic. Because it is precisely in those open countries where we haven’t seen real breakthrough or growth. Take Japan and Thailand, for example. 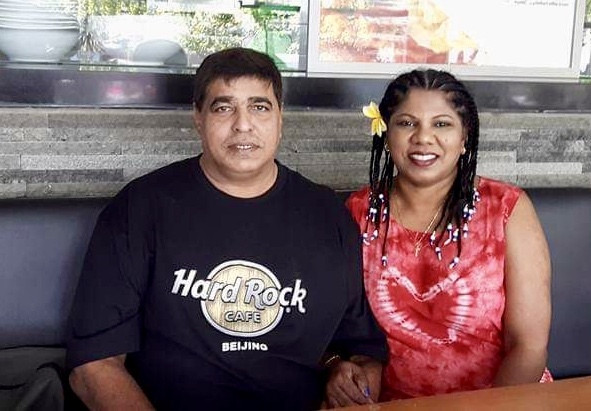 You’re free to be a Christian and it is possible to get a religious worker visa to go and be a Christian missionary. So why did South Korea see such a massive breakthrough in the growth of the Church in the last hundred years whereas Japan didn’t? Why has Cambodia and Vietnam seen such amazing church growth in the last decade whereas Thailand has not? We don’t know quite what to make of that and we wouldn’t want to assume any kind of causality. But what we do know is that in places where the Church suffers for Jesus, we also see the work of the Holy Spirit. The growth of the Church in those contexts, is just as it was in the New Testament! A challenging message for those of us in freedom: Perhaps persecution is necessary to revive the Church? In China we’ve seen immense amounts of persecution in the last 70 years but such immense amounts of church growth. It is at the point where many, many Chinese leaders have gone on record saying they don’t want the persecution to end – because they know that it creates a greater dependence on God and the context into which God can work more powerfully than if they were comfortable and free. So yes, this is a challenging message for those of us who live in freedom – knowing that perhaps it will require a bit of persecution in order to wake up and revive the church in our context. Comparing Singapore with the rest of the world, what would you say stands out about us? Mandryk: Two things: The high quality of people and the abundance of resources. I can’t help but notice the high degree of materialism that exists in Singapore. It’s very pronounced. Until you live outside of the Singaporean context for a while, you don’t realise how ubiquitous it is. So that’s a constant temptation to the Church. But Singapore has a history of quality leaders; not just in your socio-political context, but in churches! It is testament to the educational quality of the country, the maturity and discipleship in the churches here that you have the models and infrastructure that allows you to form quality leadership. That’s the exception, not the rule. In Singapore: Quality disciples whom God has gifted and effectively-leveraged economic privilege. Very consistently country to country, there is the need for leadership development and the lack of infrastructure resources and models that allow those things to happen – there’s almost no country in the world where we don’t hear of those things. But it’s also part of why Singapore is an Antioch of Asia, to use that catchphrase. 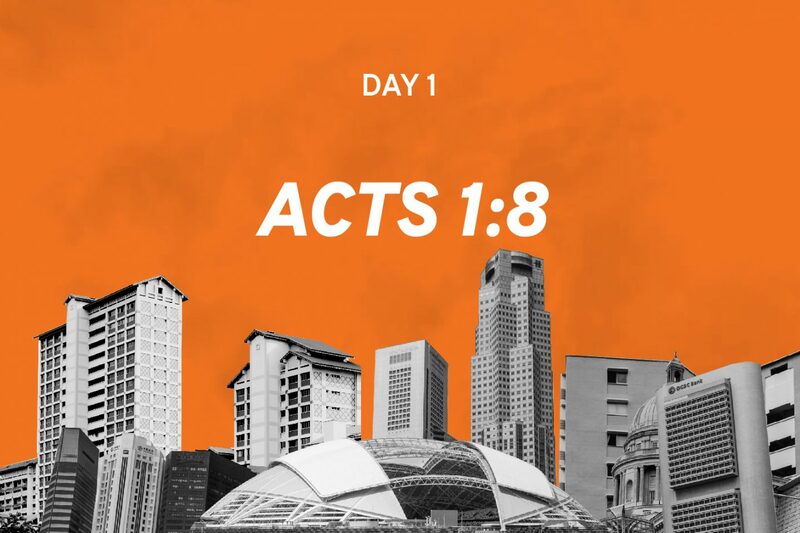 It’s because you form quality disciples whom God has gifted and the church in Singapore leverages its economically privileged position effectively to be a blessing. Singapore “exports people” in the Christian context. There are many people from very privileged backgrounds who have given their lives to Jesus and who are leveraging that privilege into Gospel impact. How do we not be overwhelmed by all the needs we are faced with in Operation World? Mandryk: We need to engage with the stories of people: Whether that’s a martyr, killed for his faith in Pakistan, or a Christian philosopher serving in Germany, or even someone like a housewife; their stories have as much validity. And they need to be able to have as much impact on us. Because we’re all uniquely made in the image of God; we cannot forget that we’re part of a family of people. It’s not always an overwhelming mix of persecution; There’s a lot of joy, breakthroughs and good news. But at the same time, I think that we need to be as shrewd as serpents and understand the world and times in which we live so that we can know how to most faithfully serve God and make an impact. It’s not always an overwhelming mix of persecution and of being ignored or disdained by an uncaring world. There’s a lot of joy, breakthroughs and good news. Churches are being planted and people movements developing and new ministry is being innovated; we have much to be thankful for. 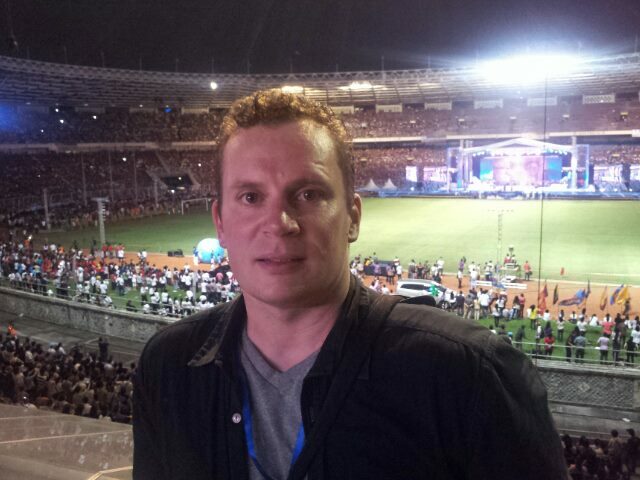 Jason Mandryk at the National Day of Prayer in Jakarta, Indonesia, 2012, where over 100,000 believers gathered. Relationships are central to the ministry; Operation World gets diverse perspectives in order to make the volume less susceptible to natural biases. We need to have the big picture as Christians in the globalised world and we also need to find the stories that resonate with us personally and keep us in touch with that individual basis of our faith. 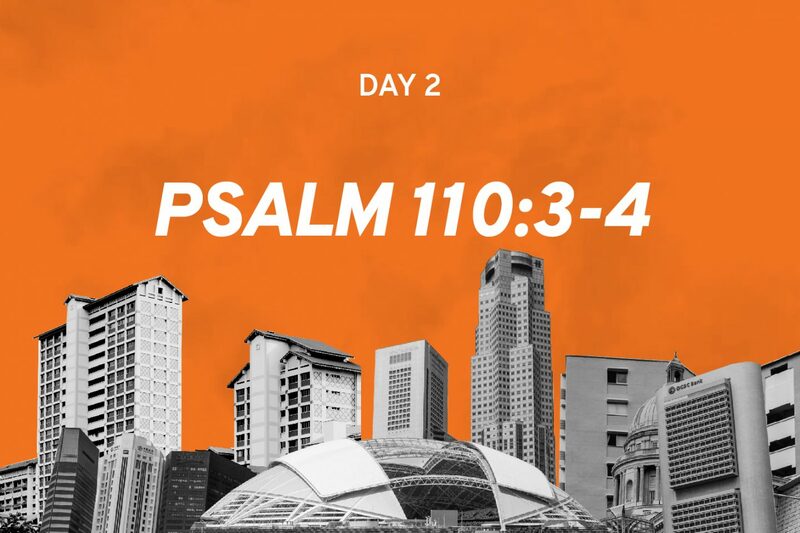 Do you have any handles for Singapore Christians on how to develop an outward-focused prayer life? Mandryk: Step by step – as with anything else. You don’t get off of your sofa and run a marathon on day one, right? You build up to it. So build a culture of prayer. And as you start to do it, you will soon begin to discern the things that resonate with you or your group; the things that tap into something that God is doing. Then move in that direction. Be in touch with the reality of the suffering and desperation. And at the same time, be aware of how God is at work globally. But the question is: In a world where there’s far more information than we have capacity to process, how do you build a culture of prayer? And what does this culture of prayer look like when it’s outwardly-focused – interceding for our persecuted brothers and sisters, for the unengaged, unreached people groups, or on behalf of communities that experience injustice and exploitation? It is easy to become self-obsessed in prayer. We’re also wrestling with this right now and walking this out in our ministry. 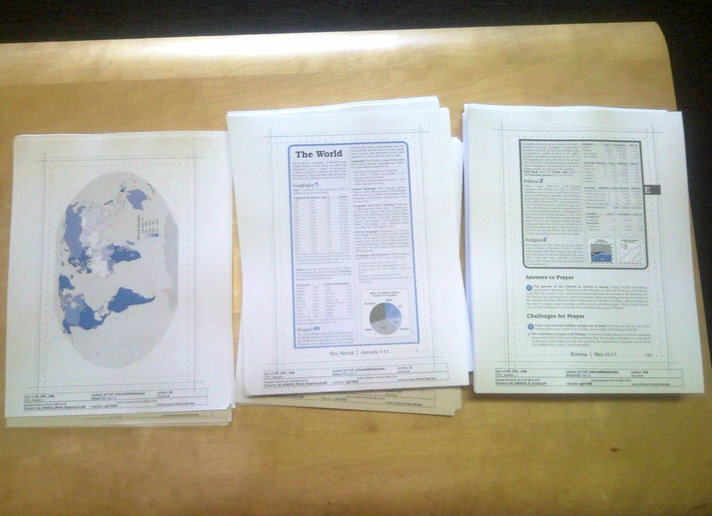 Operation World has been the resource for information on prayer needs. But we’re are now on the journey of becoming a culture-shaping entity that helps believers understand outward-focused prayer, personally. So there’s just the question of how do we integrate prayer for the nations into the normal rhythms of what we are already doing. Just explore. Follow the course wherever it takes you. Remember the “both-and”: Find the stories that resonate with you and cause tears to well up. Be in touch with the reality of the suffering and the frustration or even the desperation of the Church in some places. And at the same time, be aware of how God is at work globally. Because on the whole, it’s an encouraging story: The Church is growing and the Good News is reaching into pockets of planet earth and the human race where it hasn’t been before. 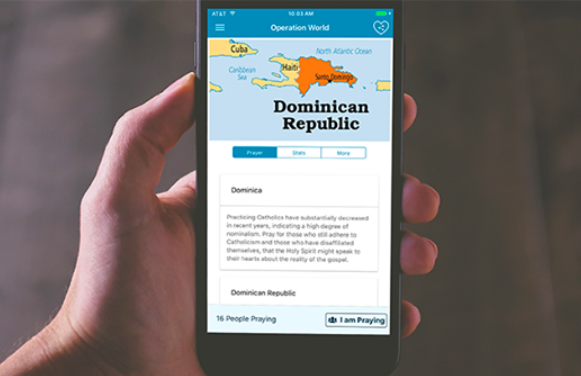 As part of its efforts to help the Church cultivate prayer for the nations, Operation World released a prayer app in June 2017.